Wow! The trees are amazing colors of red, yellow, and orange. It’s sweater and boot weather. We had another red October and its football season. Yes, that’s right its Fall here in St. Louis and it’s beautiful. One of the best things about living in the Midwest is the change of seasons. Nothing goes better with the Fall season than pumpkin although I’m not a fan of pumpkin…at all! However, I must tell you that this was delicious. It doesn’t taste anything like pumpkin pie. 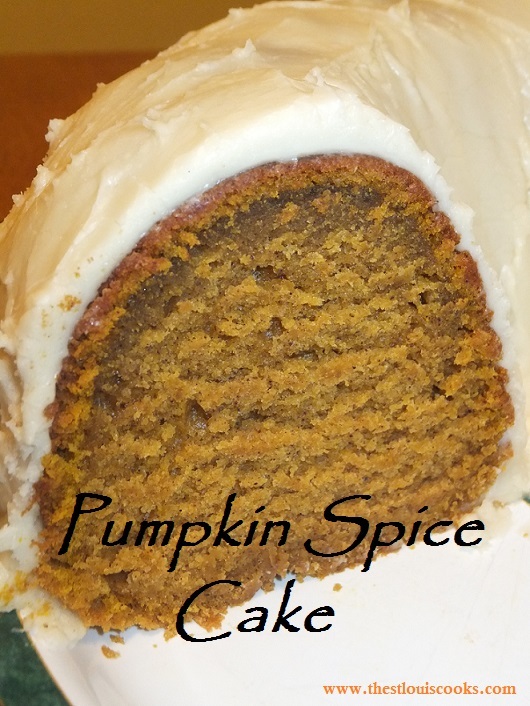 The pumpkin in this cake makes it very moist. 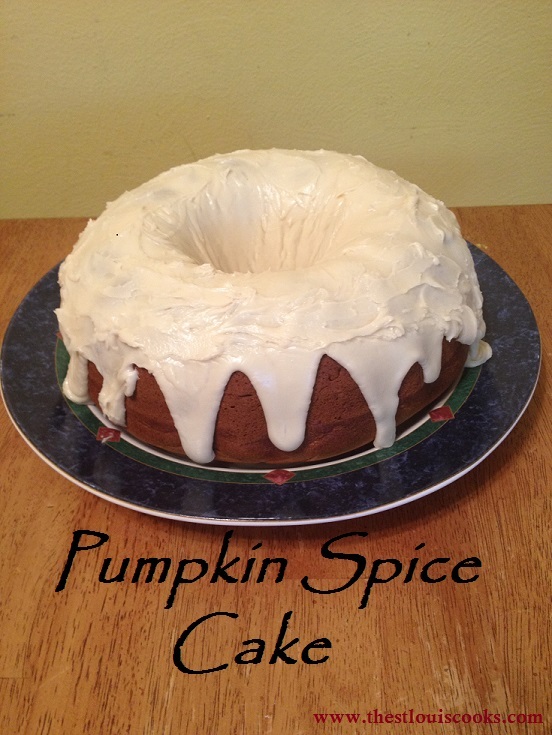 It’s a must try during the fall season or better yet, a great desert for Thanksgiving. Pumpkin lover or not, this one is a keeper. In a large bowl, combine flour, cinnamon, pumpkin pie spice, baking powder, baking soda, and salt; Set aside. In a large mixing bowl, beat butter and sugars at medium speed, scraping the bowl often. Add eggs one at a time beating well in between. Beat in flour mixture alternating with cream, beginning and ending with flour mixture. 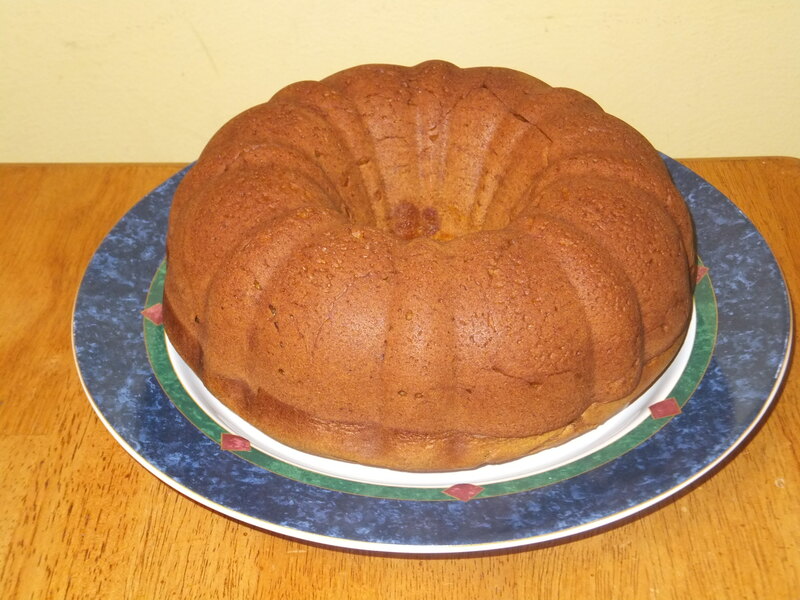 Pour batter into a 12 cup bundt pan that has been lightly coated with Pam. Bake in the oven for approximately 50 minutes or until a wooden tooth pick inserted in the center comes out clean. Cool in pan for 10-15 minutes. Invert cake onto a wire rack to fully cool. In a small saucepan, combine butter, maple syrup, and cream over medium-high heat; bring to a boil. Cook for 1-2 minutes. Remove from heat. Slowly whisk in powdered sugar until smooth. Let cool until slightly thickened, about 10 minutes. Drizzle over cooled cake. Optional – Sprinkle with candied pecans. Ohhhh wow that looks delicious!! Thank you so much! I do not like pumpkin but I loved this! Hi, the recipe listed, 1 Can (15 oz.) Pure Pumpkin… when do I add that in?